Boots, Flying, Knee, 1939 Pattern. Stores reference 22c/228. Size 8. 1940 dated. Classic Battle of Britain boots identical in pattern to the earlier 1936 pattern but with vulcanized canvas uppers. The leather shoe section is in good condition showing average wear and tear. The canvas uppers are also good, they retain strong colour and do not have the usual wear at the ankles. This pair is fitted with the less commonly found canvas strap/buckle. Both are in very good condition. Loss of lining fur is common with these boots and this pair is no different. There is some moulting / fur loss, notably in the left boot around the calf area and below the 'V' cut at the front. The right boot lining is much better with small areas of moulting lower in the leg. No insoles fitted. The boots have been resoled but these have been stitched in the same way as originals. The heelplates have also been replaced at some point. 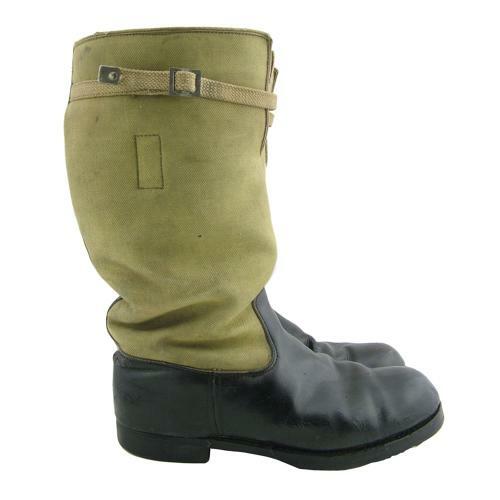 Complete with clear Air Ministry King's crown markings and 1940 date code on the puller of each boot. A.I.D marks are printed on the other pullers. A good '+' used pair of these rare early boots. Stock code B23425.